PHOTO: The Key West Village features cottage-style accommodations. Sandals Resorts’ recent expansion of its Beaches Turks & Caicos Resort Villages & Spa, one of several upscale resorts strung along Providenciales’ magnificent Grace Bay Beach, is another example of the company’s desire to give vacationers even more of a good thing. Sandals has operated the Beaches property here since 1995 but, as it has done with its other Caribbean properties, the company has consistently implemented improvements and upgrades to its accommodations, facilities and services to fit its guests’ changing vacation tastes, as well as to accommodate more of those vacationers. Those are the goals behind the newest feature at Beaches Turks & Caicos, the Key West Luxury Village, a new wing of upscale accommodations at the 75-acre resort. Fashioned from the former Veranda Resort, a luxury condominium property built adjacent to the existing Beaches resort, the new Key West Village features 150 cottage-style suites and villas, three restaurants, private pools and butler and concierge services. The new wing, like the resort itself, is certainly aimed at the family market, and every subgroup within that broad category. Families with young children and multigenerational families, including babies, grandparents and teens, were in evidence across the property during a recent visit. Also spotted during the week were two wedding parties, a group of girlfriends and Dual Income, No Kids (DINK) parents reconnecting with their college-bound young adult children. Key West Village is adjacent to the resort’s Italian, French and Caribbean villages and is linked to the others by landscaped interior gardens, courtyards and walking paths. The all-inclusive property is very much in the Beaches tradition of family-friendly resorts, with features and amenities that include a full-scale waterpark, an Xbox Play Lounge, a Kids’ Camp and a dedicated teen nightclub. As with other Beaches properties, the Turks & Caicos resort also offers a wide variety of premium accommodations including deluxe rooms and suites offering butler and concierge services. The property features a large and lavish outlet of the resort’s signature Red Lane Spa, and families will also enjoy the resort’s Caribbean Adventure with Sesame Street, which offers children opportunities to spend their vacations with Sesame Street characters and participate in daily activities and weekly stage shows. Although its clientele includes families and multigenerational groups, the resort also accommodates romantic couples traveling for destination weddings and vow-renewals. The Key West Luxury Village is the resort’s first new addition since the Italian Village debuted in 2009. Gordon “Butch” Stewart, Sandals founder and chairman, recently described the Key West Village as the linchpin in the company’s strategy to attract family clientele who are seeking a deluxe vacation experience, and are willing to pay for it, to the Turks & Caicos resort. The approach has not only made Sandals successful, but has also provided opportunities for travel agencies and tourism marketers, Stewart said. “We are the only Caribbean operator that can get volume and rate for a tour operator,” he said. 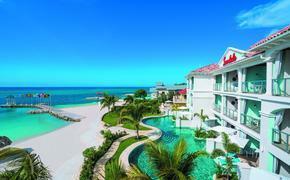 Beaches Turks & Caicos’ Caribbean Village will be revamped beginning in December. “If your hotel gets tired, you are buried,” said Stewart. 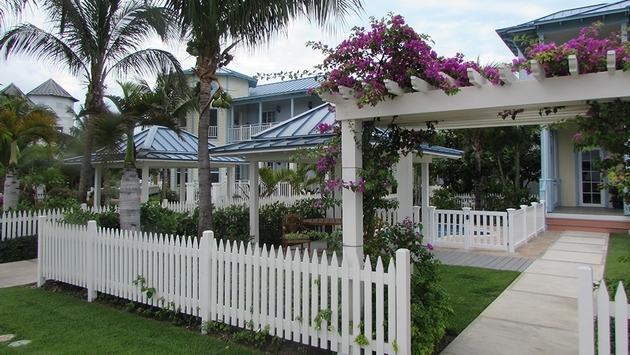 PHOTO: Accommodations wings at Beaches Turks & Caicos are connected by landscaped gardens. The new Key West Village comprises villas and two-story buildings reminiscent of Key West. Every Key West Village room is concierge level and above, and accommodations include 20 Butler Service villas and suites, all featuring kitchens with stainless-steel appliances and espresso machines. The kitchens provide an additional dining option for families. The central Veranda House is a four-story building with deluxe rooms and one- and two-bedroom loft-style suites. There are eight exclusive villas with three or four bedrooms set along the beach for groups and even multigenerational families vacationing together. These accommodations feature private pools and verandas. The Italian Village is adjacent to the Key West Village and offers guests a lively and statuesque collection of terraced buildings surrounding lush formal gardens and a central pool framed by fountains, statues and decorative arches reminiscent of Renaissance Italy. Large family-suite accommodations are concentrated here. Also in addition to a selection of luxury, concierge and butler rooms and suites, the complex features an Italian restaurant and an entertainment and shopping piazza. Caribbean Village accommodations include gabled cottages and the boutique-style units are finished in pastel colors and set among picturesque gardens teaming with colorful vegetation. The grounds are dotted with beachside gazebos and lounge chairs where couples can enjoy romantic private moments, plus shaded hammocks perfect for stretching out to read a book. The section also features three restaurants: Arizona’s, which serves Tex-Mex and barbecue specialties; Reflections, an outdoor venue serving international fare; and Schooners, a seafood eatery. Each of the sections is located within close range of Grace Bay Beach, easily one of the top white-sand beaches found anywhere in the Western Hemisphere. 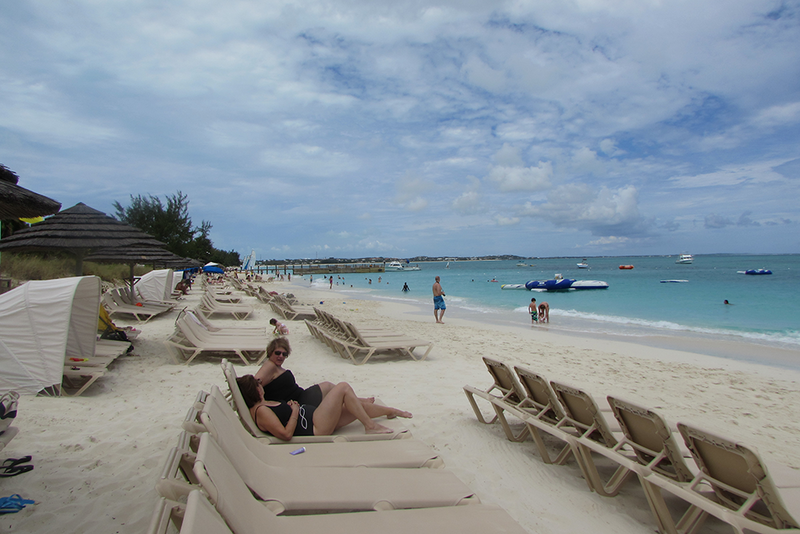 PHOTO: Beaches Turks & Caicos overlooks Providenciales’ Grace Bay Beach. The Key West Village’s launch adds several additional guest facilities to a resort already filled with options. The new wing features three swimming pools, joining large and small pools in both the Italian and Caribbean villages. Meanwhile, the Italian Village also features Pirates Island, a 45,000-square-foot water park. Key West Village has a new children’s center and a fully equipped fitness center. Gazebos are strewn at various points across the long, calm-water beach, and hammocks swing along the beachfront. Other beachfront lounging areas are lit by fire pits at night. The French Village’s gardens are modeled after Versailles and the area also features a “Left Bank”–style, tree-lined boulevard with restaurants and outdoor cafés as well as a stage where nightly music and dance entertainment is performed. The Caribbean Village features an exotic flower garden and two swimming pools, both equipped with swim-up bars. The Italian Village offers a zero-entry pool with a sweeping ocean view. Guests will also find a variety of games and activities across the resort and a staffed nursery for parents along with supervised activities. There’s also Trench Town, a teens-only game room, an Xbox Play Lounge and the Liquid at Beaches nightclub. Beaches Resorts’ Discovery Dining program features internationally trained chefs who create authentic cuisine to take guests on a global gastronomic expedition. The Key West Luxury Village’s launch gives the resort three new dining options, bringing the total number of restaurants to 19. Bayside offers international cuisine at breakfast, lunch and dinner and overlooks Grace Bay Beach. Sky features grilled steaks and seafood served on a rooftop terrace overlooking the beach, and Neptunes is another beachside restaurant featuring fresh Mediterranean fare. Mario’s offers Northern Italian-inspired cuisine served from an open kitchen, and features a special medieval-themed children’s area. Kimonos is a Teppanyaki-style eatery accessible to guests via a small wooden bridge. Sapodilla’s offers traditional gourmet fare, while Bobby Dee’s offers casual family fare. A version of this article appears in print in the August 2014 issue of Agent@Home Magazine.